Model WB, 120, 240 or 208 volts, will serve 6 people full time (120v. serves 4). Has mounting plate with vibration protection, 2 year warranty. Each toilet comes with 1 box of 200 liners. Prices good for U.S. and Canada only. Allow 1 to 2 weeks for delivery. Replacement parts and accessories are always in stock; if you don’t find what you’re looking for, or have any questions, please call us at (214) 358-4238 or toll-free at 1-800-527-5551. Model WB, 240 or 208 volts, will serve 6 people full time The 120v. version serves 4. Model WB has a mounting plate with vibration protection, 2 year warranty. Because it drains nothing out, it is US Coast Guard certified for all waters. INCINOLET must be installed on a 20 amp dedicated circuit and have its own vent to the outside. Prices good for U.S. and Canada only. Allow 1 – 2 weeks for delivery. I like it, I have always wanted to get one for years and years. I was wondering three things. First, can I use this WB toilet for my 1974 Winnebago Indian motor home? Second, can I vent it down, or will there be a problem with road dust, air intake, or anything else if used when moving? Lastly, do I need to change the size of my house batteries? You know, will I have enough juice, or do I need to beef up the batteries like they do for a solar system? I do have a 4000 watt generator onboard, but I’m not sure what I might need to do to power this beauty. OH Yeah, one other thing, is stainless steel standard for the outside? I noticed that you offer a white exterior, is it possible to get it’s skin to match the seat at the same $100.00 ? I think the generator would have to run more than you would like for this toilet. It would be pulling 13.4 amps off and on during its 75 min cycle. I don’t own one (yet) but really like what I see. Have a question….why does this unit have a mounting plate with vibration protection, where others don’t? The WB model is for boats and is Coast Guard certified. Are these units usable for pet waste? Not really it was designed for human waste. I’m not sure how it will perform with pet waste. Have had one (really two as we replaced the original after many years) in my second home for years. NO WINTERIZING needed–a real plus here in Wisconsin. Parts are easily accessed, and replaced as needed which is not often. Just love it. Only complaint, when servicing the inner parts with top off, stainless steel edges are sharp. Thank you for your comment. Can you tell me if you had problems with sharp edges on the newer model or older one? If the trailer won’t be moved a round then you could get a CF model. 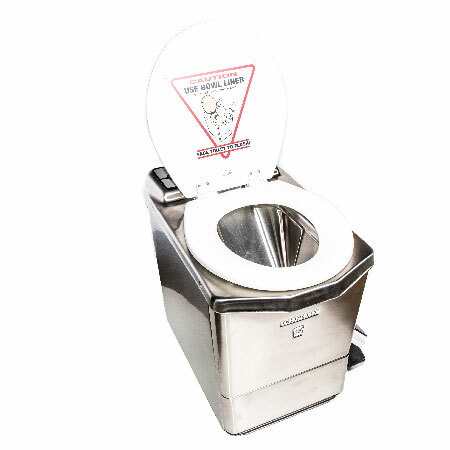 We have been building incinerating toilets for over 62 years and never had an incident. I’m looking into getting one for spring time on my property. How bad is the smell outside when burning it? In the beginning of the cycle you will have a burning paper smell. This will go away as the catalyst heats up. I was wondering about Anthony’s question above regarding whether it can be vented downward, underneath the RV. I am also wondering about being required to give a rating to submit this question? I have not purchased one yet, but hope to! You can vent it down as long as you have good air flow under the RV. I will have to check on the rating system. I don’t think you have to leave a rating to leave a question. Yes they are we sell them all the time for this purpose. The 240v can handle more people, so I would go with it. It appears the 240 volt version is more “heavy duty”, as the commentvsays it can handle 6 people full time. How are it’s power usage different on a per usage basis? Eg: if one cycle is started at let run to completion will it use 1,800 watt hours like the 120V version, or more? The 240 volt has a 3500 watt heater but it gets hotter faster so the heater starts cycling on and of quicker than the 120 volt model.So the 240 volt model and 120 volt model use about the same amount of power. Just bought a second Incinolet WB. Used on a 83′ boat. Bought the 1st to avoid installing a holding tank for no discharge zones. Another benefit of the Incinolet is that when standard marine toilets fail, it’s a nasty job to fix whether it’s the motor, valves or plumbing. The 1st toilet (120v) has been used about 7 years in daily use without needing any replacement parts. At that time I changed the heating coil, but the old coil still was working fine. From lifting both, the new 240v is heavier. I like the 240v better and any more toilets I order will be 240v. We never found the smoke to be an issue. The smell is a general burning smell that has no sewage odor and is mostly water vapor. With an additional blower and proper plumbing, the exhaust could be discharged underwater. Emptying the ash/burn pot is clean and easy. The ash is dry, looks like ordinary wood ash, and has no smell I can detect. Away from the dock, I run these toilets on the inverter unless a generator is running. Occasionally at anchor, I nest with other boats. The ladies often cross over to use my toilet because they hate the usual marine toilets – small, low, and uncomfortable. Also, womens toilet products can be flushed and burned, too. Will be doing some work to a camper/RV. So just needing to know, are these ok to install/use in a RV?? If so, which model(s) is recommended?? -also note, it will be “plugged in”, not running off a generator. Thanks for any info and advice! The CF or TR would work for you just buy the mounting plate if you will be moving the RV around. Also Interested. would like to buy one and replace the RV toilet. first is it about the same size as the RV toilet? The RV will not be going any ware soon, as my house burned down so I will be using it for some time ans possibly using your toilet in a cabin if I ever get one made. I also have a question on continuous use. I have my mom here and sometimes she has to go 8 or 9 times back to back in an hour, will this unit still work? Or if we have a party? Please let us know, thank you for your time. Call us and we can talk. But it won’t be able to handle that much use in such a short amount of time. I HAVE NOT PURCHASED THIS ITEM, BUT I AM UNABLE TO ASK A QUESTION WITHOUT PROVIDING A RATING. I DO NOT WANT TO SUBMIT A LOW RATING AS I DO NOT WANT IT TO AFFECT YOUR PRODUCTS RATING. SO I AM GIVING IT A 5. MOVING FORWARD I HAVE A Question, my husband and I drive a semi truck cross country. We currently have an ARI (Legacy Sleepers) sleeper, our sleeper is 144 inches, of that, is 132-inch livable area. Our bathroom has a combination toilet and shower. I would love to use your product, as I wouldn’t have to worry about emptying out the cassette at a dump station. Currently, when we take a shower, water does go into the toilet. After we are done we open the compartment the water falls into the holding tank. We have a 7500-watt Owen generator, which we use for the rooftop air conditioner, I know that our inverter runs our Refrigerator and 1 electric outlet. The generator runs 2 outlets, a convection oven, and roof air, and charges our batteries when running. We basically have an RV that makes us money. We have a shell already for the current toilet (provided it fits) from the current toilet, problem being do you have a lid that will lock to seal water out of the bowl area to keep water out from the toilet itself? I know water and electricity don’t mix well… I haven’t found an area where I may attach a picture to show you more specifically. Guess you can go to legacysleepers.com to view, http://www.legacysleepers.com/2014-Peterbilt-386-with-144-Inch-ARI-Sleeper. Your thoughts and comments would be appreciated. Have not purchased one yet but I soooooo want one for my RV as we will be starting out full time adventure in nov 2019. I have been reading reviews and it seems as though it takes a LOT of power to operated and do not wish to run a generator for an hour and a haft for each flush. I was looking into solar but that seems way to complicated. Are there any alternative power friendly versions? I do understand that it is an incinerator and will require power but was hoping for something more efficient for an rv…..any ideas???? PS. i needed to leave a rating in order to submit this e-mail….my rating in no way reflects on the product as I do not currently own one!!! Check out a company called Cinderella the make a propane powered toilet for RV’s. Thanks for the heads up about the comment page problem, I have someone working on it right now. You should give us a call. Something is definitely wrong with your toilet.